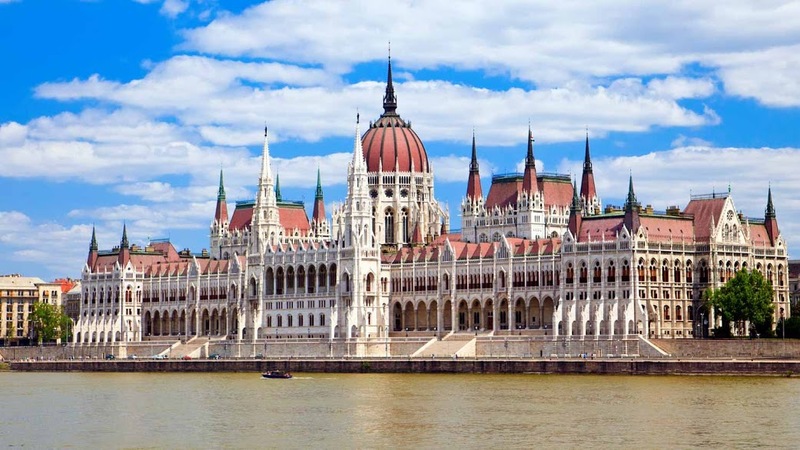 Enjoy convenient pickup from your hotel and take a guided tour of the fascinating Hungarian Parliament building. 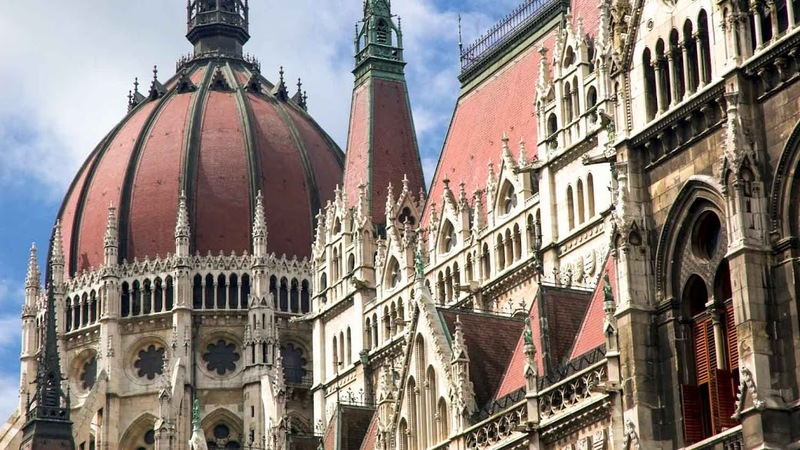 Budapest's striking parliament building, which took 1,000 workers 13 years to complete, on the banks of the Danube in Pest, is the third largest in Euorpe. Be it day or night, or viewed from a distance in hilly Buda, this iconic symbol is a sight to behold. Imre Steindl submitted his plans upon the official call for a parliament building in 1880. The Gothic Revival design reflects the inspiration he found in the Palace of Westminster. 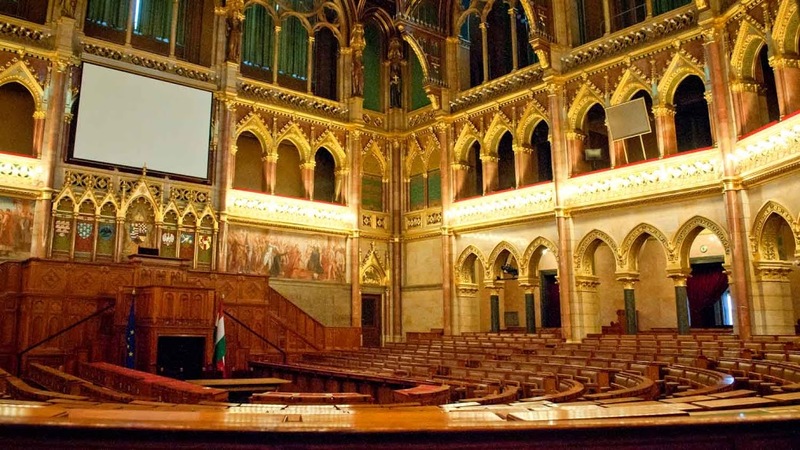 90 statues on the outer walls reflect Hungarian monarchs and military commanders. Though not typical in Gothic design, the dome rises 314 feet from the center of the building. The lavish décor brims with the influences of Renaissance and Baroque. The Natonal Library, which holds 500,000 volumes, and the Hungarian Coronation Regalia are also inside. 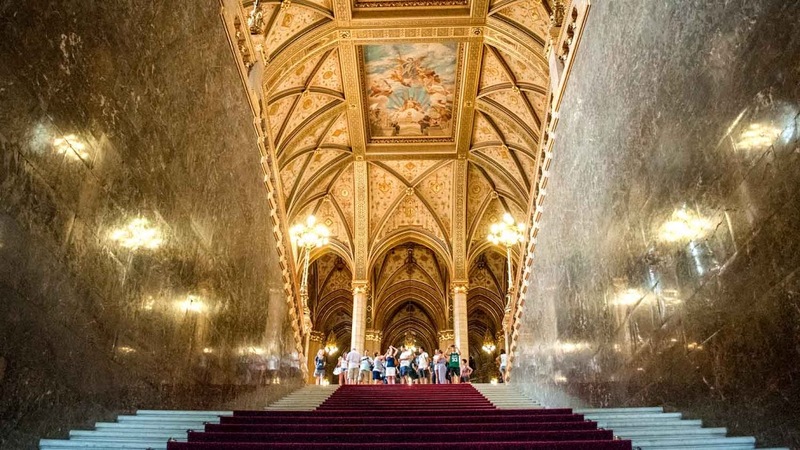 These stairs lead to the Dome Hall, amid a stunning setting of allegorical ceilng frescoes, which illustrate the governing of the country, and 16 statues holding coronation symbols. Parliamentary sessions with both houses occur below the interior of the dome, which rises 88 feet overhead. The statues and coat of arms of 16 rulers line the walls of the hall. May 1 - September 30 from 8:00AM - 6:00PM (Monday - Friday); 8:00AM - 4:00PM (Saturday); 8:00AM - 2:00PM (Sunday). October 1 - April 30 from 8:00AM - 4:00PM (Monday - Friday); 8:00AM - 4:00PM (Saturday); 8:00AM - 2:00PM (Sunday). 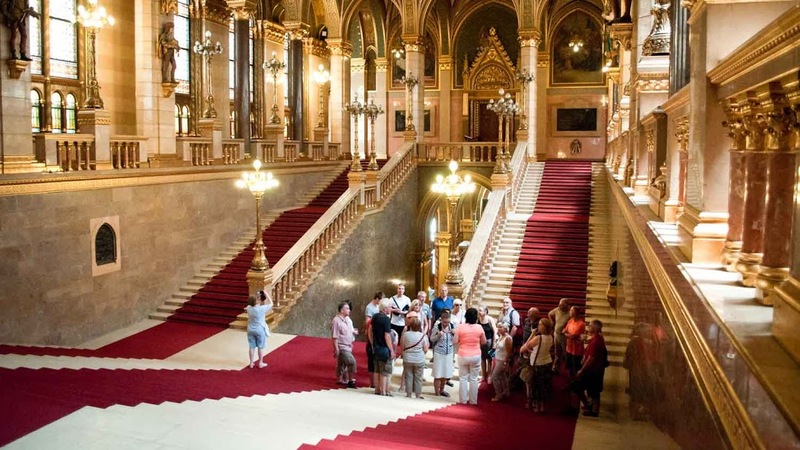 The 50-minute, English-language tour takes place daily at 10:00AM, 12:00PM and 2:00PM. Tickets cost 2,520 forint (HUF), and it's advisable to book the desired time in advance online. Keep in mind that tickets are limited every day, and some days may be closed to the public due to official events. The starting point is at the Visitors Center at the end of Balassi Bálint Street. Summer weekdays 8:00AM-6:00PM, winter weekdays 8:00AM-4:00PM, every Saturday 8:00AM-4:00PM, every Sunday 8:00AM-2:00PM. Adult entrance and tour tickets are 2,520HUF, or just under $10. Tours are provided by the staff and are the only way to see the interior, but check out our other tours of the area! This attraction is within walking distance from many hotels in city center! Buy your tickets at gate #10, then proceed to gate #12 for the tour. The boat was very comfortable, service was excellent and the cruise was very enjoyable. Audio guide attached to the seats gave good information about the city. Received two drinks - the lemon tea was especially great.